What is it exactly that makes a particular dress elicit the description “ladylike”? Is it primarily the fabric – or the color – or the style – or, as most would suggest, a combination of all these things? And why, exactly, am I asking this question?? 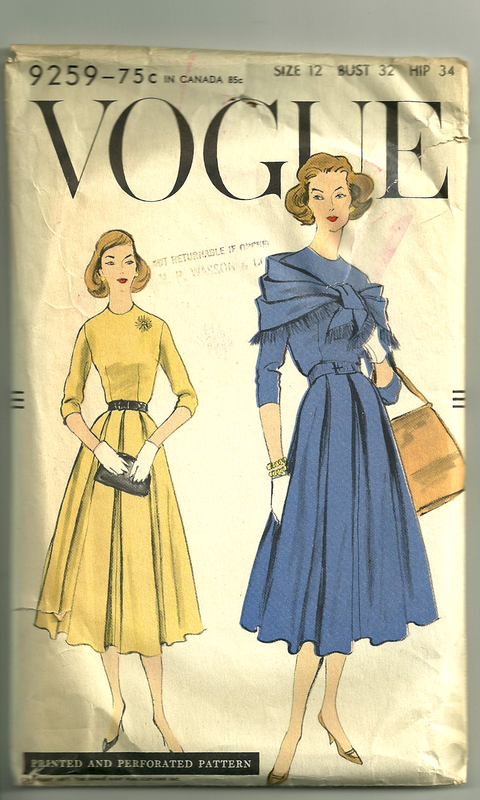 Dated 1958, this pattern shows the influence of Christian Dior. This is what I’ve decided. I definitely think you start with the style – or the pattern – and this one has it. There are four elements which work together to make this a ladylike look: 1) a defined waist, here further delineated with a purchased belt (or, as the pattern calls it, a “novelty” belt); 2) a soft shoulder line, which in this pattern consists of a set-in sleeve on the front bodice, but kimono in the back – very clever; 3) a full skirt, this one with inverted box pleats which soften the fullness to a considerable degree (although not quite enough for me, as I will explain later); 4) three-quarter length sleeves, which are the most flattering for most women, and which provide the perfect foil for bracelets or gloves. The middle sketch on the back of the envelope shows the kimono sleeve detail on the back of the dress. I’ve had this pattern for well over a year, but it took me a while to pair it with this fabric which I’ve had forever (well, not that long, but probably close to 10 years – which makes it seem like a baby compared to how long I’ve had some of my Moygashel linen!). I’m not sure the fine twill weave of this fabric is visible here. 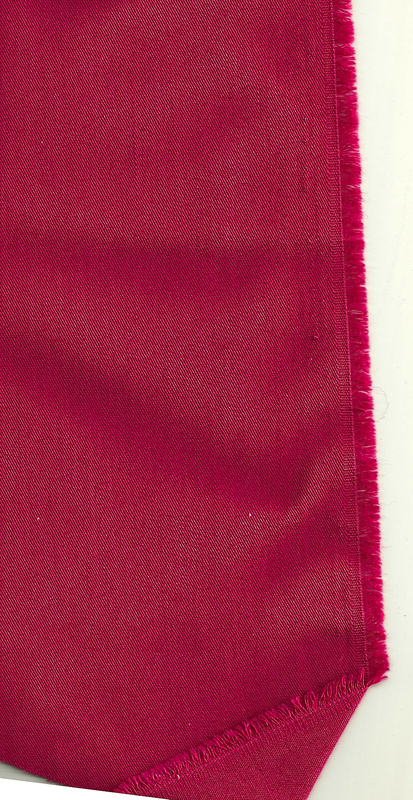 This fabric is a very beautiful wool/cotton blend, lightweight, but with a solid hand and very subtle fine twill weave to it. It’s 60” wide and I bought three yards, so I obviously had plenty of fabric with which to work. I’m in love with the color, a deep raspberry pink – I just cannot stay away from pinks of any shade. Knowing that I would be making this dress in knee-length rather than mid-calf made me reconsider the fullness of the skirt. In thinking about this, I remembered another pattern in my collection, which shows a full skirt in the front and a fitted, plain skirt in the back. 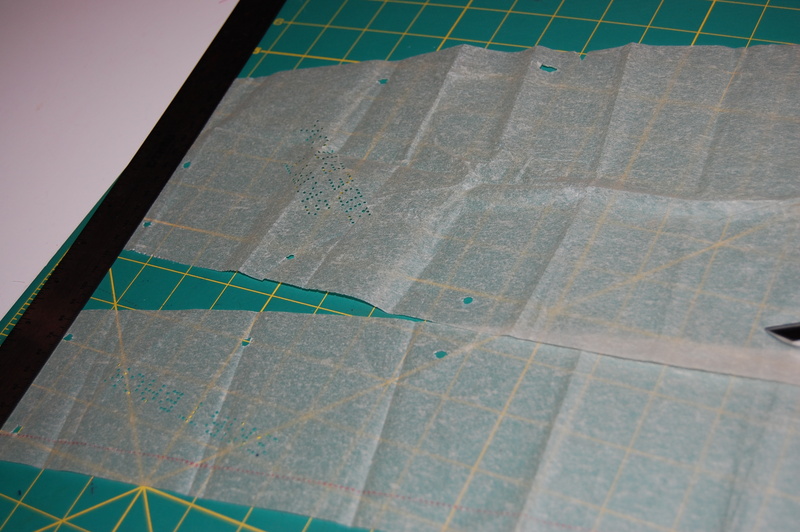 This is an unprinted pattern, which makes working with its pieces difficult. So – I decided to see if I could combine the two patterns to create the same look, but with less fullness. The second pattern has a three piece back, which obviously would not work with a center back zipper. Here is the detail of the skirt back. So I decided to combine the side back and center back pattern pieces, add two darts to achieve a similar fit, and add a center back seam to match the seaming in the first pattern. This is how I fit the two back skirt pieces together to make one piece. The “triangle” became two narrow darts, which seemed to work better than one wide one. 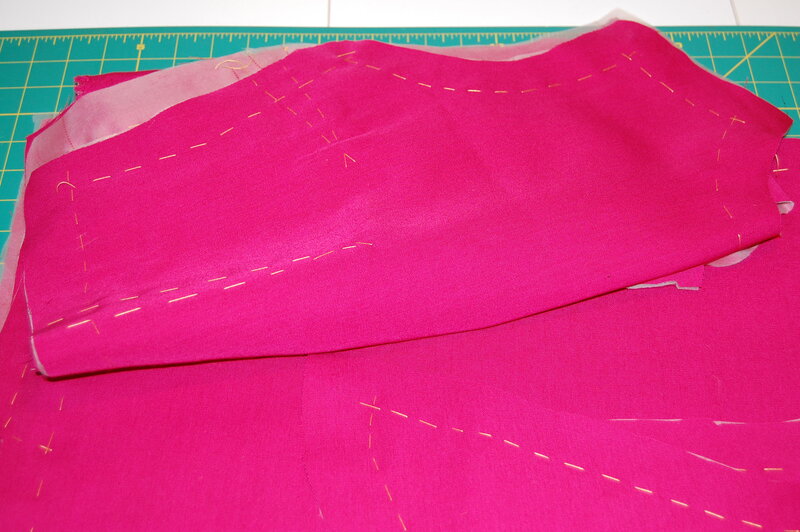 I took a little more fullness out of the front pattern pieces of the first dress and reconfigured the box pleats. Then, of course, I made a muslin to see if this would all work. It certainly seems like it will. The width of the skirt, according to the pattern envelope, was originally supposed to be about 100”. The width of my muslin skirt is 56” – which means I removed over a yard in the skirt width! Sometimes things look and hang a bit differently in the fashion fabric as compared to the muslin, so I am proceeding with cautious optimism. I am making the dress with couture techniques – and I’m ready to do some serious sewing now that I have silk organza hand-basted to all the pattern pieces. My pile of basted pieces. In sewing, I am always reminded of this quote from Wilhela Cushman: “Just around the corner in every woman’s mind – is a lovely dress, a wonderful suit, or an entire costume which will make an enchanting new creature of her.” I do indeed hope this will turn out to be a lovely dress – with enchanting ladylike qualities! I love the color of your fabric (I’ve actually been eying some wool online that looks the same color)! And I really like the interesting half set-in half kimono sleeve – never seen that before. Well, I’m keeping my fingers crossed that my changes will actually work well in the end! I really like both patterns! I love dresses from the 30’s-50’s that button in the front. I found a great pattern at a second hand store last week, where do you find yours? 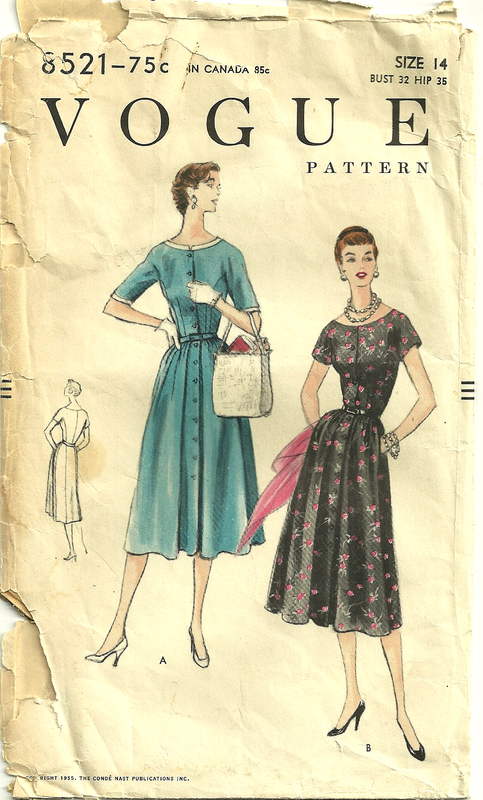 I find most of my patterns on eBay and Etsy Vintage; some of my patterns from the 1970s are actually ones I purchased when I was in my 20s – just wish I had saved them all. I’m enjoying the making of this dress – the fabric is a dream to sew with! Thanks so much for your comment. How lovely to find a wonderful pattern – fabric combination. You have me hooked so far on the construction details so please don’t stop!! You know, frock was a common word in the ’50s, but you are correct, now it seems kind of frumpy. For some reason, I kind of like the word, though – can’t quite figure out why! I’ll definitely be posting about the construction details of this dress – thanks so much for your interest!